It has long been a cliché that muscle bulk doesn’t equate to intelligence. In fact, most of the science to date about activity and brain health has focused on the role of endurance exercise in improving our brain functioning. Aerobic exercise causes a steep spike in blood movement to the brain, an action that some researchers have speculated might be necessary for the creation of new brain cells, or neurogenesis. Running and other forms of aerobic exercise have been shown, in mice and men, to lead to neurogenesis in those portions of the brain associated with memory and thinking, providing another compelling reason to get out at lunchtime and run. Here’s a video and a little advice on how to make it through the winter snow and not get hurt. Read the entire article written by Deborah Kotz from Boston.com below. It’s blizzard time in the Boston area this weekend, with a severe winter storm expected to dump 15 to 20 inches of snow on the Eastern Massachusetts region. Besides the usual aggravations of clogged, slippery Monday morning commutes, you need to prepare yourself for the big dig out. Please join us for a Grand Opening Party on Friday January 21st from 6:30pm-9pm. 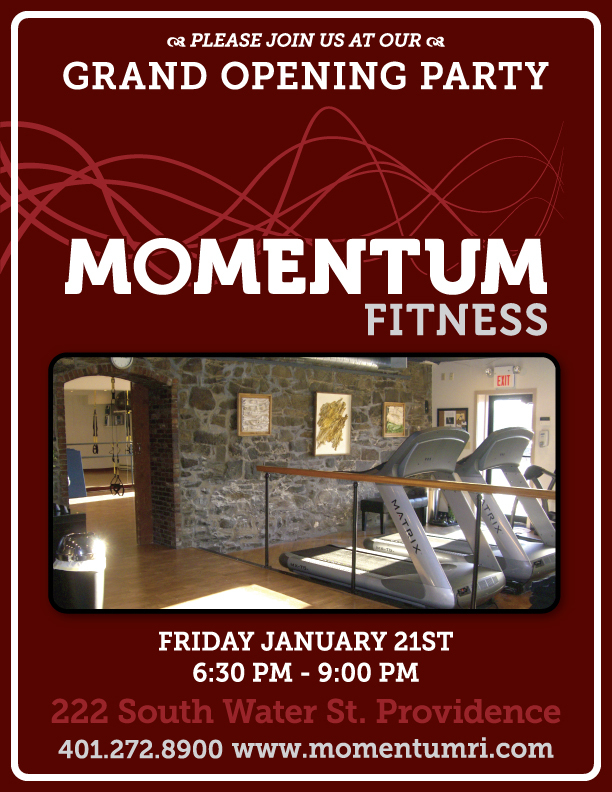 Feel free to invite your friends or anyone who might be interested in what Momentum Fitness has to offer. We truly appreciate your support. January Session Classes begin on January 10th and run for 3 weeks. Class size is limited so sign up soon! The January classes are : Core & Stretch- Mondays at noon, Circuit Training- Wednesdays at noon, and TRX-Thursdays at noon. All classes are 1 hour long. Come spend your lunch hour with us at Momentum Fitness! For more info or to sign up, call 401 272-8900 or email info@momentumri.com. What a nightmare, but it turned out pretty much perfect. With 4 lengths of rubber flooring- 200 lbs each, 4 rolls of 5” double stick tape, 3 utility knives, and 6 amateur installers (us, our spouses and our friends), we managed to get the job done in 7 hours flat! Unfortunately we didn’t get a picture of our super efficient installation technique. Let your imagination run wild. Read more to see more pics. Thank you Dave for making a very dusty mess in the installation of our TRX support beams and mounts. Michelle and Rob mopped the floor about 8 times, and now the room is ready for TRX class. The dates for this class are Thursdays 1/13, 1/20, and 1/27 at noon. Give us a call at 401 272-8900 or email us at info@momentumri.com if you’d like to register. You can read a class description on our Classes Page. Read more to see more pics.